Cast: Shah Rukh Khan, Waluscha De Sousa and Shriya Pilgaonkar. Special Makeup Effects Artist: Greg Cannom (Oscar winning artist). Well, you know the story of the film FAN so there is no meaning of writing anything about that but yes it’s a bit lengthy and slow because there is no song so two and a half hour is too much for them who are not an SRK Fan. I must admit that I have become his fan once again. The way He talks, dances, Looks, walk, adaa Badhu j jaane 25 varsh no fattaaak Jawaaniya hoy aevu. Chalo maana ki young admirer Gaurav ke look ka credit jaata hai prosthetics, Khatroo special effects & Makeup ko but character mein Jis tarike se Shahrukh ne Jaan daal di hai boss… Jabro Majjo Padi gayo aeni acting maa! (Btw the makeup artist called Greg Cannom is a multi-Oscar nominated makeup man who has won the Oscar thrice). Negative role mein Shah Rukh Khan already made a name with Baazigar, Darr and Anjaam. Somehow I liked obsession se bhara character played by Shahrukh Khan. 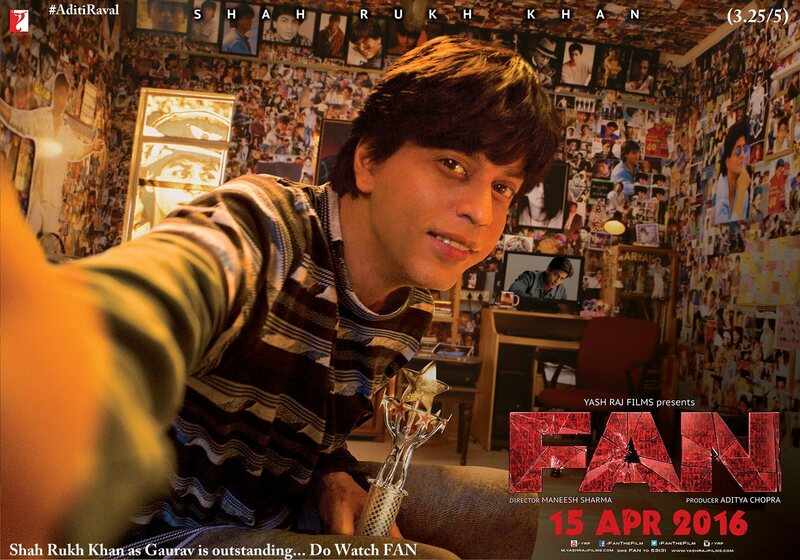 Let me share quick review of the film FAN. Fav Scene: Senior Junior ke bichh ka fark bhula dene vala Performance by Gaurav Chandna. Fav Feel: 90s ke Shah Rukh Khan ki Jab Jhalak aati hai tab TBT jaisi feel aa jaati hai. Likeable Part: Shah Rukh Khan as Aryan Khanna Ekdum hi Attitude ki Dukaan and ek Taraf as Gaurav too much Sanki. It is genuinely difficult to play such roles so I liked dono character mein balance rakhnewala part. Watchable or Not: Yes It’s a must watch for Shah Rukh Khan Fans and even if you are not a fan of SRK, It’s a decent one time watch especially for the character called Gaurav played by Shah Rukh Khan. Fan ni Feel chhe… Badha Naa Samjhe…! If I against the Khan….?? Still it watchable move ?? Please reply me..